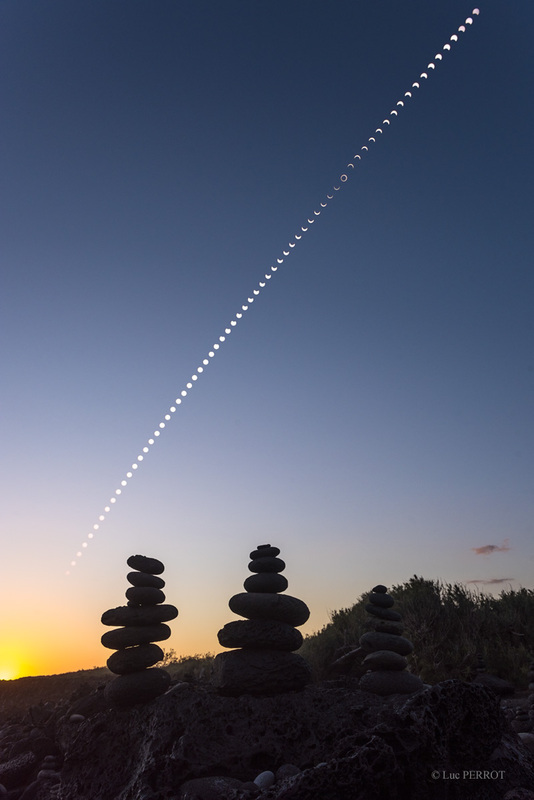 Explanation: September's eclipse of the Sun is documented in the 68 frames of this timelapse composite. Starting at 1pm local time a frame every 4 minutes follow's the progress of the New Moon across the solar disk. Taken near the centreline of the narrow eclipse path, the series of exposures ends with a golden sunset. Balanced rock cairns in the foreground line a beach on the southern side of Reunion Island in the Indian Ocean, near the village of Etang-Salé. Of course, the close balance in apparent size creates drama in eclipses of the Sun by the Moon as seen from planet Earth. In an annular eclipse, the Moon's silhouette is just small enough to show the solar disk as a narrow ring-of-fire at maximum eclipse phase.